First published 2013, English translation 2015. 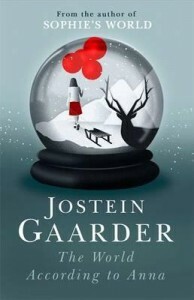 Jostein Gaarder became famous quite suddenly in the English speaking world with the publication of Sophie’s World twenty-odd years ago. The World According to Anna is a much slimmer volume but is intended for a similar age group and takes a similar approach, teaching its subject by embedding it in a novel. The topic this time is not philosophy but climate change, and especially the moral imperative to act for the sake of inter-generational justice. Anna, about to turn 16, has a perfectly normal, happy life in her small town in Norway except that she has unusually vivid dreams, in some of which she meets her great-grand-daughter Nova who is the same age in 2082. Nova’s world is suffering the effects of climate change: mass extinctions, coastal inundations, food shortages and endless waves of climate refugees. Anna’s visions of this future world reinforce her budding sense of the need to act on climate, and the book ends with her determination to make Nova’s world come untrue. There’s more to the story than that, of course, but I don’t want to spoil anyone’s enjoyment by giving it all away here. I collected a long list of Greenie Fiction for young people a few years ago and the questions I asked there need to be answered here, too. Is it accurate and relevant? Is it a good book? Who should read it – or is likely to read it? The answer to the first question is a resounding “Yes”, but the other two are not so clear-cut. It is beautifully written and its characters are appealing but there is not a lot of story in it and its momentum is clogged with fact-dumps: Anna is continually reading articles or watching documentaries about what is happening to the environment. I can imagine many young readers (and it is suited to readers 11 and above) finding it a bit slow. On the other hand, adults may enjoy it as a gentle introduction to the subject, as seems to have happened with Sophie’s World. “The World According to Anna reads less like a novel than a pamphlet on climate change for dummies. Previous Previous post: Autumn in Spring?